Karnataka state assembly elections are scheduled for 12 May 2018. The Congress, Bharatiya Janata Party (BJP) and Janata Dal (Secular) (JD(S)) are the major political parties contesting in this elections. These parties are now busy in deciding the distribution of their party tickets to the candidates contesting in these elections. The incumbent chief minister of Karnataka Siddaramaiah has been chosen to be the chief ministerial candidate yet again by the Congress for the upcoming assembly elections. He will be contesting from the Chamundeshwari constituency in Mysuru. The party also released its first list of candidates on Sunday. G T Devegowda of the JD(S) is the sitting MLA of the Chamundeshwari constituency. However, Siddaramaiah has had a strong hold over this constituency since 1983. He had contested from the constituency as an independent candidate in 1983, and had bagged 43.33 per cent votes. Contesting for the Janata Party (JNP) in 1985, he had won with 43.45 per cent vote share. He contested again in 1994 for Janata Dal (JD), and bagged 54.46 per cent votes. In 2004, he contested for JD(S) and represented Indian National Congress (INC) in 2006 bypolls, winning with 47.24% of the votes – from the same constituency. There has been a significant and consistent rise in the vote share of Siddaramaiah since 1983. It was speculated that he would be contesting from both Badami and Chamundeshwari constituencies in this elections, according to a report in The Economic Times. However, following the suggestion of the party seniors, Siddaramaiah will be contesting only from Chamundeswari – the constituency that has delivered victory to him five times between 1983 and 2006. The report in The Economic Times also noted that 102 sitting MLAs, 15 Muslim and women candidates have figured in the first list. Twelve party-hoppers have also been given tickets: Zameer Ahmad Khan (Chamarajpet), N. Cheluvarayaswamy (Nagamangala), H.C. Balakrishna (Magadi), Ramesh Bandisiddegowda (Srirangapatna), Iqbal Ansari (Gangavati), Akhanda Srinivasa Murthy (Pulakeshinagar) Bhima Nayak (Hagaribommanahalli) – resigned from JD(S), Anand Singh (Hospete) – resigned from BJP, B. Nagendra (Kudligi) and Satish Sail (Karwar) – the independent candidates, Ashok Kheny (Bidar) of Karnataka Makkala Party (KMP) and H.Y. Meti have also been given tickets. JD(S) was the first party to release the list of its candidates for the upcoming assembly elections. It was released even before the date of the election was declared. The first list named 126 candidates with H D Kumaraswamy (HDK), the ex-Chief Minister of Karnataka (2006-2007) as the party’s chief ministerial candidate. He will be contesting from the Ramanagara constituency. A report in the Deccan Chronicle noted that HDK is confident of winning from the constituency and has said, “I will not go to Ramanagara to campaign. Let Mr Siddaramaiah campaign there for the rest of the time. I will still win hands down.” HDK was getting back at Siddaramaiah, who had challenged him by questioning his knowledge about Siddaramaiah's political history. 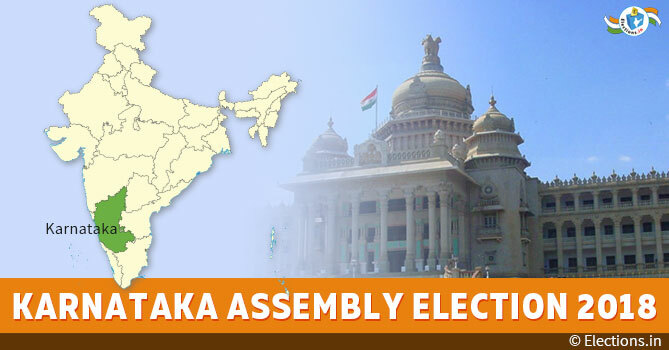 Karnataka state assembly elections are scheduled to take place on May 12, 2018. The Congress, Bharatiya Janata Party (BJP) and Janata Dal (Secular) (JD(S)) are the major political parties contesting in this elections. These parties are now busy in deciding the distribution of their party tickets to the candidates contesting in these elections.